Greetings from the Land of Santa Claus, in the Far North at the Arctic Circle. The busy yuletide season is soon upon us, and Santa is preparing his sleigh for another world tour. The old man is very busy, but fortunately the elves are there to help him deliver the Christmas spirit to the world’s children. The Ou-Hou (OH) people are also bringing Santa to the ham community as in many past years, utilizing some high tech to assist him. With the help of multimedia and the Internet, a dozen or so elves will operate Santa Radio, OF9X, with their own identity. As a reward for contacting several of them, your brave children, grandchildren, or neighbors’ children may even speak with Santa himself. 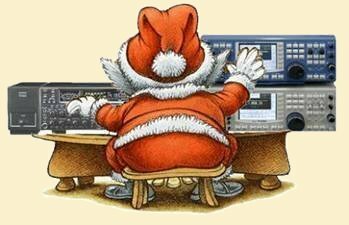 Amateur Radio’s future resides in our youth, and Santa can be their first contact with the art. This year’s activity will also pay respect to the ARRL’s late President Emeritus, Jim Hayne, W5JBP, who became a SK at the time the Santa script was in making. We wish to carry on the spirit of his mission – the Big Project – in this format. The certified reindeer driver and Laplander Pertti “Pete” Koivula, OH2BEE/OH9U, will give Santa a face and voice, tapping into his professional background as a famous actor of the Helsinki City Theatre. Pete is well known from his role in the Finnish national movie “The Unknown Soldier,” exploring those difficult bygone times of war, still remembered by seasoned Finns. The Santa activity’s end will mark the beginning of Finland’s Anniversary as a 100-year-old sovereign and independent nation. The patron of the OF9X Santa Activity is Mr. Juha Sipilä, the Prime Minister of the Republic of Finland. Mr. Sipilä indicates his sincere support of Finland being the home of Santa and states that "using the latest technology to promote Santa is valuable support for Finland and helps make this Christmas a special one." He further expresses his pleasure of "welcoming an increasing number of visitors, such as those from America and China, who come to explore the treasures of Finnish Lapland by flying directly to Santa Claus Airport at the Arctic Circle." More details will be released soon. The OF9X (Old-Father-9-Christmas) activity is supported by the Finnish Telecommunications Regulatory Authority (FICORA) and the Finnish Amateur Radio Association (SRAL), and is organized by Radio Club of Pusula, OH9W with Radio Arcala, OH8X of Oulu, the frozen North.